Italy used to be many different, smaller countries. Between 1815–1871 Italy started to form these smaller states and became one country, the Kingdom of Italy, led by Vittorio Emanuele II of Italy (Called Victor Emanuel II in English). Starting around 1848, nationalism and patriotism became popular throughout Europe. Many people wanted the smaller countries with similar culture, language, or ethnicity to join together. This resulted in two major countries being formed. The first was Italy in the Italian unification. The second was Germany in the German unification. Risorgimento (also called Italian unification or unification of Italy or 'the resurgence) refers to the Italian movement for independence. Risorgimento literally means resurgence in the Italian language. The movement truly began in 1848, when there were many revolts occurring throughout Italy after Klemens Wenzel von Metternich lost his office of Austrian Chancellor. The movement for independence succeeded in 1859 through the efforts of Count Cavour, the Piedmontese prime minister, as well as Giuseppe Garibaldi. - an Italian national hero, who united the South, which allowed King Victor Emmanuel to become the first King of Italy. Napoleon invaded Italy in 1796 and later controlled it, but when he was defeated in 1815, in the battle of Waterloo. it became possible for the now free states to join together. Victor Emmanuel of Piedmont-Sardinia saw a great vision of a unified Italy. He wanted Piedmont-Sardinia to be a model for the unification of Italy. To do so, he started many public works, projects, and political reforms. Piedmont-Sardinia was soon recognized as an emerging power. The next step for Piedmont-Sardinia 's conquest was to get Austria out of the Italian Peninsula. With the Crimean War breaking out between France and Britain on one side, and Russia on the other, Piedmont-Sardinia saw a chance to earn some respect and make a name for itself. Britain and France proved victorious, and Sardinia was able to attend the peace conference. As a result of this, Piedmont-Sardinia gained the support of Napoleon III. In 1858, Sardinia and France secretly plotted a plan of attack against Austria. The following year, Sardinia put its plan into action and provoked Austria into declaring war on Sardinia. 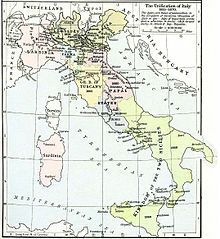 By Sardinia's encouraging nationalist revolts in Austrian-held territories in Italy, Austria was provoked into the war. Following the battles of Magenta and Solferino, France drove Austria out of Lombardy, but Austria still held onto Venetia. At this point, France dropped out of the war, fearing a unified Italy might be a threat, as well as realising that Austrian Strength would eventually crush them. This ended the war, with Austria keeping Venetia. Meanwhile, the Italian nationalist Giuseppe Garibaldi led a nationalist uprising, combining the states and territories into a full Republic. As Sardinia ended the war, Garibaldi gave most of the provinces to Sardinia. In March 1861, a parliament of all of Italy except Rome and Venetia, agreed on unifying Italy with Victor Emmanuel as its first king. This page was last changed on 23 February 2018, at 21:09.